Jammu and Kashmir, India. s fascinating northernmost state consists of three regions differing in topography and culture. Jammu was the stronghold of Hindu Dogra kings and abounds with popular temples and secluded forest retreats. Kashmir. 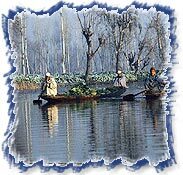 s capital city, Srinagar offers delightful holidays on the lakes with their shikaras and houseboats. Amongst the three regions of Jammu & Kashmir state, Jammu, perhaps, offers the widest diversity of terrain and beauty. The entire region is pocketed with lakes and valleys, some still little explored. 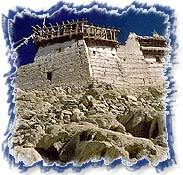 The foundation of the settlement of Jammu is attributed to King Jambulochan of the 9th century BC. In 1730 AD, it came under the Dogra rule of Raja Dhruv Deva and Jammu became an important centre for art and culture, now reknowned as the Pahari School. Religion, too, played an important part in its development, so beautifully evidenced in its various shrines and temples spread throughout the region. Ranbireshwar Temple; Raghunath Temple (Raghunath Bazar); Raghunath Temple (Purani Mandi); Ranbir Canal (3.5 kms); Bahu Fort (5 kms); Bage Bahu (5 kms); Amar Mahal Palace Museum ; Dogra Art Gallery . » Akhnoor : 32 kms. Regular bus-services available from Jammu. » Batote : 113 kms, 1560 metres. Health Resort on the Jammu-Shrinagar highway. Accommodation is available in huts (Rs.200 for double) and Tourist Bungalow (Rs.175 for double & Rs.25 per bed in dormitory). » Kud : 106 kms, 1738 metres. Resort on Jammu-Shrinagar highway. Accommodation available at Tourist Bungalow (Rs.175 for double, Rs.250 for suites). » Mansar Lake : 80 kms. Regular bus-services available from Jammu. Accommodation is available in huts (Rs.325 for double) and in Tourist Bungalow (Rs.175 for double, Rs.325 for suites). » Purmandal (Chhota Kashi) : 39 kms. Religious place connected by bus with Jammu. Accommodation is available in pilgrim shelters. » Patnitop : 112 kms, 2024 metres. A resort & picnic spot on the Jammu-Shrinagar highway. Accommodation available in huts (Rs.475 for double, Rs.300 for single), Tourist Bungalow (Rs.250 for double, Rs.325 for suites) and Youth Hostel (Rs.40 per bed in dormitory). » Ramban : 148 kms. Accommodation available in Tourist Bungalow (double Rs.150). » Ramnagar : 102 kms. Regular bus-services available from Jammu. » Sanasar : 129 kms, 2079 metres. 19 kms from Patnitop, slightly away from the National Highway. Accommodation available in huts (Rs.250), Tourist Bungalow (Double Rs.150, Rs.15 / head in dormitory without bedding). » Sudhmahadev : 120 km, 1225 metres. Accommodation available at pilgrim shelters. » Surinsar Lake : 42 kms. Picturesque spot. Accommodation available in huts. 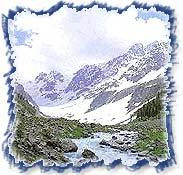 » Kishtwar High Altitude National Park : 248 kms. 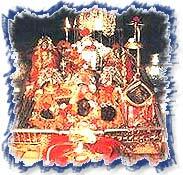 The holy cave shrine of Vaishno devi is situated in a beautiful ranges of the Trikuta Mountains forming a part of the lower Himalayas as in the state of Jammu & Kashmir at an altitude of over 5000 feet. In the cave there are images of three dieties viz. the Mahakali, Mahalakshmi and Mahasaraswati. The shrine can be visited throughout the year, but during the winter season the route is often blocked by snow-fall. Beyond the Kashmir valley lies Ladakh, the land of unsurmountable mountains, and fascinating monastries. Ladakh is the abode of rare Kiang & highland Yak. Leh its capital city lies at the Tri junction of the historic silkroute from Sinkiang to West Asia and to the plains of India. Leh Khar Palace, Leh Monastery, Leh Mosque, Tsamo Gompa. Kargil has beautiful Imambaras at Trespone and Sankho representing Turkish architecture. Attached to these Imambaras there are famous Arabic and Persian speaking Muslim divines known as ghas. Mulbak Monastary 190 kms, Lamayura 125 kms, Alehi Gompa 135 kms, Likir Gompa 140 kms, Phiyang Gompa 20 kms, Spitak Monastary 8 kms, Snaker Gompa 3 kms, Shey Palace Monastary 15 kms, Thiksey Monastary 19 kms, Hemis 49 kms. 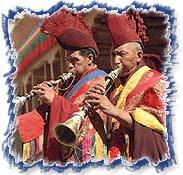 Ladakh is a virtual paradise for Adventure sports-Mountaineering, trekking White water rafting / canoeing etc. For mountaineering the Zanskar Range, the Ladakh range and recently opened Karakoram range offer some of the finest challenges and schedule for reservation is available with Indian Mountaineering Foundation, Banito Juaraz marg, New Delhi, Tel: 671211.For Trekkers, Ladakh has immense possibilities. 3. Padam-Tongde-Zangla-Sher Sher La-Chup Cha-Shang Kong Ma-Kurna Sumdo-Nari Narsa-Lang Tan-Hankar-Nima Ling-Shakdo-Hemis (14 days) Trekking equipment can be hired from Leh Tourist Office, on nominal charges and its recommended that they should be consulted for information & guidance. Indus and its tributaries provide exciting opportunities for rafting/caneoing. The Mughals aptly called Kashmir, Paradise, and they journeyed across the tortuously hot plains of India,to spend summer in the cool environs of Srinagar. And here they laid, with great love and care, Srinagar's many formal, water-front gardens, now collectively known as the Mughal Gardens. Today's Srinagar is a pleasure resort for the tourist who can experience, at first hand, the peculiar beauty of the valley that has attracted the Chinese, the Mughals and the British to it. Pather Masjid 6kms, Shah Hamdan Mosque 5 kms, Jamia Masjid 5 kms, Hari Parbat Fort 5 kms, Nagin Lake 8 kms, Hazratbal 9 kms, Shalimar Bagh 15 kms, Harwan 19 kms, Nishat Bagh 11 kms, Cheshma Shahi 9 kms, Pari Mahal 11 kms, Shankaracharya Temple 5 kms, Daal Lake 0.5 km and Shri Pratap Singh Museum at Lal Mandi. » Pampore : 13 kms. The only place in the world, where saffron is grown. » Mattan : 61 kms on Pahalgam road. Accommodation available at a Tourist Sarai. » Achabal : 58 kms via Anantnag, altitude 1677 metres. Accommodation available at Tourist Huts and in a Cafteria. » Kokernag : 70 kms, altitude 2020 metres. Accommodation available at Tourist Hut , Tourist Bungalow and in Cafteria. » Verinag : 80 kms, altitude 1876 metres. Accommodation available at Tourist Bungalow and in Cafteria `Qahwa-Khana'. » Daksum : 85 kms, altitude 2513 metres. Accommodation available at Tourist Bungalow and in a Cafteria. » Yusmarg : 40 kms, altitude 2377 metres. Accommodation available at Tourist Bungalow and Rest House . » Acharbal : 51 kms, altitude 2400 metres. Famous for Waterfall falling from a height of 24.4 metres. Accommodation available at Tourist Bungalow and PWD Rest House. Kounsernag Lake,11 kms away from Acharbal, remains frozen and covered with icebergs till late June. » Manasbal : 32 kms, altitude 1560 metres. Lake with flowering lotus plants and is a bird-watchers paradise. Accommodation available at Tourist Huts and Rest House . » Burzahon : 24 kms. Excavations reveal settlements dating back to about 2500 BC. » Ganderbal : 19 kms. Situated on the bank of the River Sindh (Indus). » Wular Lake : 60 kms, altitude 1580 metres, area 125 sq.km. Lagest in India. » Charari-Sharif : 30 kms. On the road to Yusmarg. » Dachigam National Park : 21 kms, altitude 2400 metres. Accommodation available at Tourist Huts .